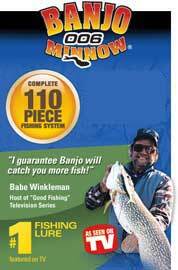 The new Banjo 006 Minnow incorporates new enhanced "swimming cuts" making it easy to swim the new minnow! It looks exactly like a real fish, swims exactly like a real fish but most importantly, it can mimic the spastic action of a wounded dying minnow. The new patented detachable eyes provide more versatility than ever and come in 2 different weights so you can fish in deeper water!